Within the next few weeks schools across the country will be opening their doors. Parents are already purchasing school supplies their child will need. Some parents with teens leaving for college are preparing for their empty nest ~ travel plans and the extra expenses of having a child in college add up. One thing that doesn’t change no matter what time of the year it is or what grade your child is going into, from elementary grades through college years — is bullying and cyberbullying. No one is immune to becoming a victim of a bully. No one is immune to being an upstander either. 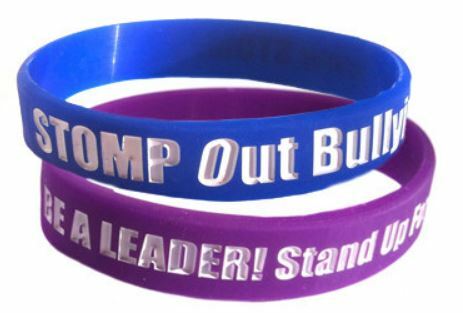 Let’s begin the school year by adding to your school supply list a wristband that lets everyone know you won’t tolerate bullying. Be an upstander! Be proactive – be a voice that creates kindness! Kindness is a choice – as is bullying. 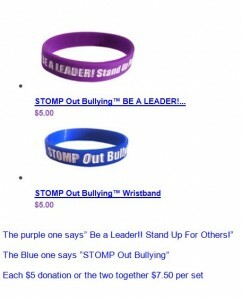 Make the choice to STOMP Out Bullying! Be the difference in your school this year! STOMP Out Bullying™ focuses on reducing and preventing bullying, cyberbullying, sexting and other digital abuse, educating against homophobia, racism and hatred, decreasing school absenteeism, and deterring violence in schools, online and in communities across the country. STOMP Out Bullying is a fantastic organization that continues to help thousands of children and families and this is an opportunity be part of their mission in making our world a better place for everyone. To order your wristbands click here.